Williams Striped tomatoes can grow quite large with a slice almost covering up a plate. An heirloom from Glensdale, Kentucky. Heirloom Seed Packet. Becoming a popular new bi-color variety. 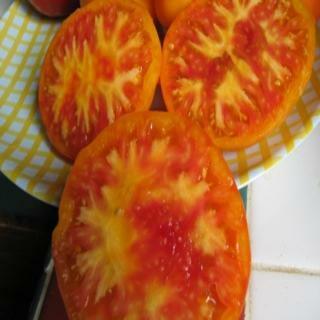 Tomatoes from these seeds can grow quite large with a slice almost covering up a plate. Stripes start as a star on the blossom end and and radiate through the sweet flesh. An heirloom from Glensdale, Kentucky.